Lille Bakery at Refshalevej 213A is in what I've been told were the drawing offices for the apprentices at the ship yards. The bakery was launched on the savings of a group of friends and with crowd funding so there is a very strong community feel to the project. 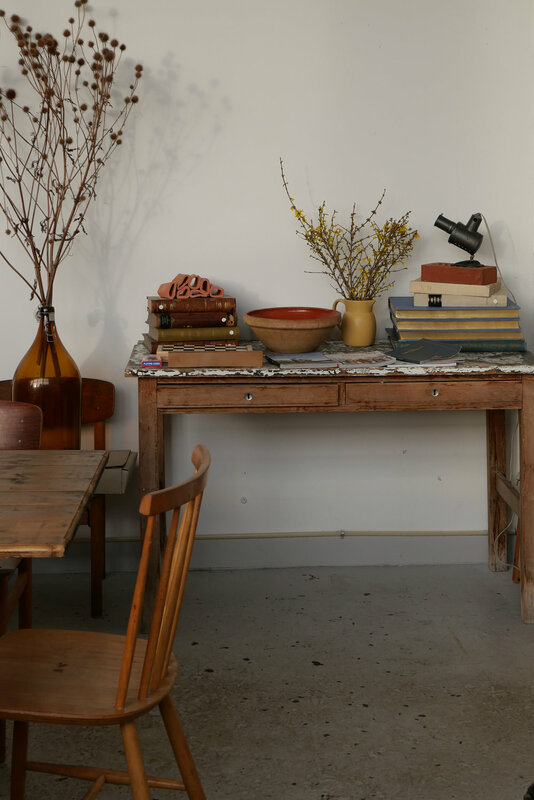 The space has communal tables with a comfortable mix of furniture and is open to the kitchens and bakery. Sourcing of ingredients is ethical and, where possible, local and the bread is fantstic … the large sour dough loaf I tried had a strong and incredibly tasty crust and it is certainly worth my bus trip or 30 minute walk preferably walking both ways to justify trying all the different cakes. 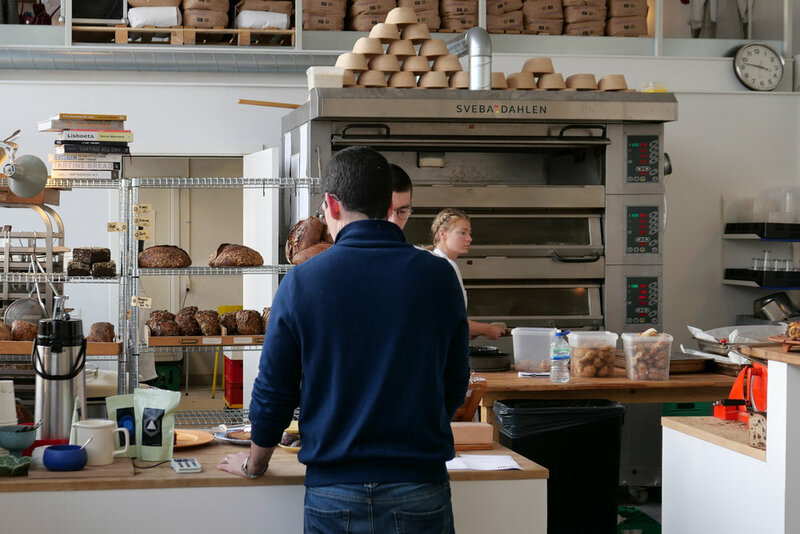 Check out their web site - it could hardly be better and includes information about booking the space for events and for their "bread subscription" to order loaves by the month. 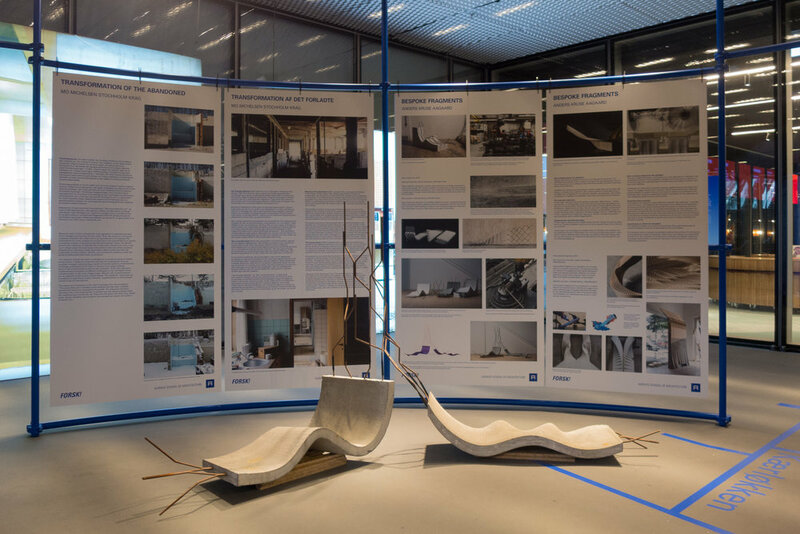 This exhibition at the entrance-hall level of the Danish Architecture Centre in Copenhagen is on the work of eight research students and graduates from Aarhus School of Architecture. These projects cover a wide range of subjects from understanding natural and historic man-made drainage as it has to adapt or be adapted for increased rainfall - a consequences of climate change - through new possibilities in the way we use traditional materials like concrete and, for wood, how new techniques of digital fabrication can be used to develop new forms of construction. As people move into cities some buildings in rural settlements in Denmark have been abandoned and one of the projects looks at how we assess buildings that are no longer needed and might be demolished and looks at how we understand and remember buildings that are part of a common cultural heritage. “Each project further illustrates a rising need for interdisciplinary dialogue to both develop and build knowledge and hereby influence the world. 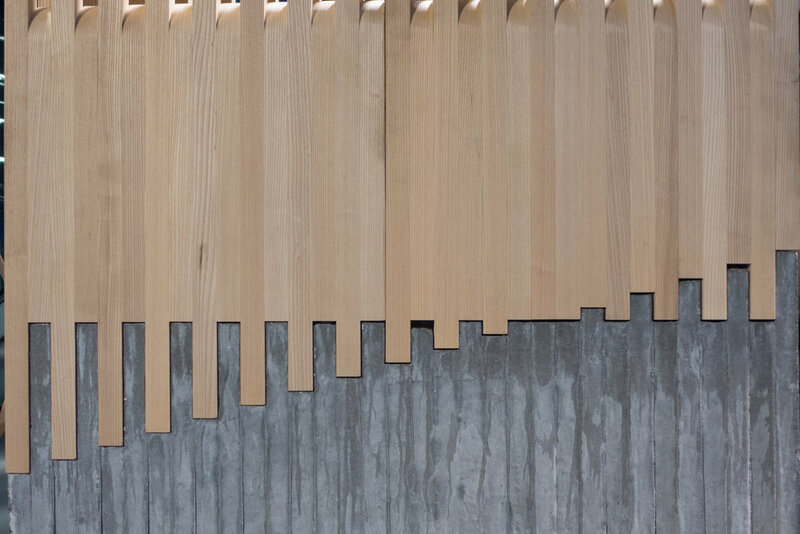 explores how we shape materials - here by using digital control of a router to cut precise joins to construct a complex lattice of curved and twisting sections of timber. 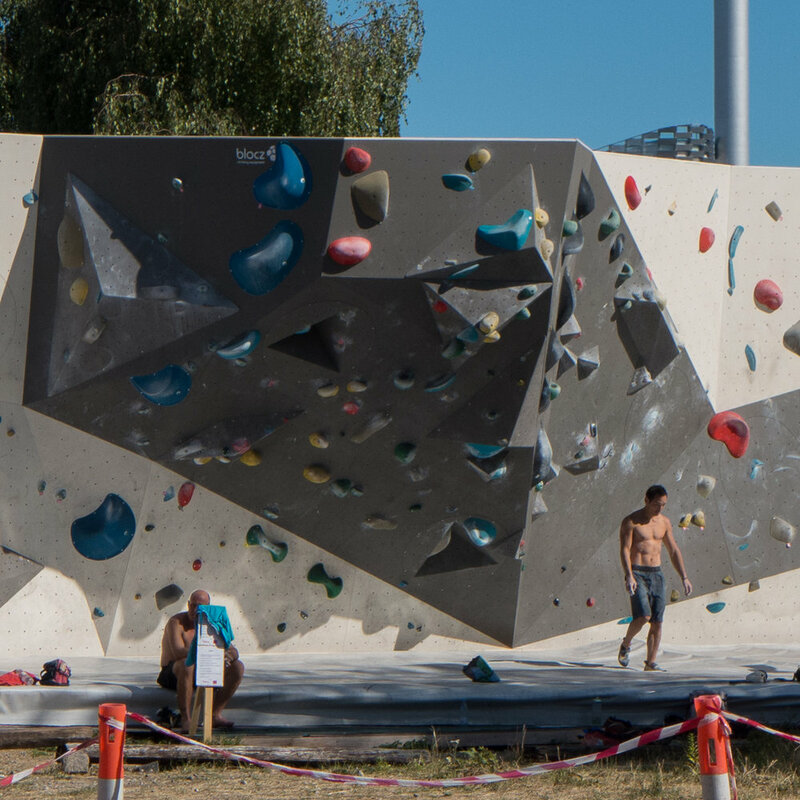 Concrete is normally flat and relatively smooth but here a rubber membrane that has a pattern of cuts made with a laser is used for the former and is supported in different ways as the concrete sets. 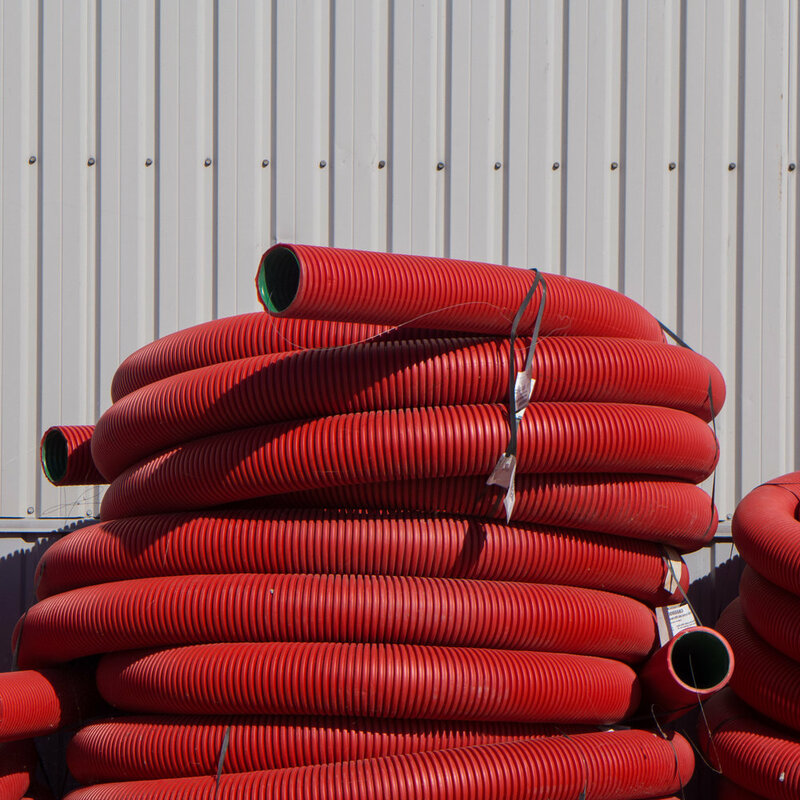 The weight of the concrete means that the rubber stretches and as the cuts stretch they distort or twist to reveal a different characteristic of concrete that as it sets changes from a viscous fluid to a solid. In many settlements, particularly if they are low lying or close to the coast, modern expansion is often over marginal land - building on meadows and marshland that had taken or slowed down surface water when rain was heavy. Maps can show features of the landscape that have been overlaid by man-made drainage systems over decades or even over centuries. 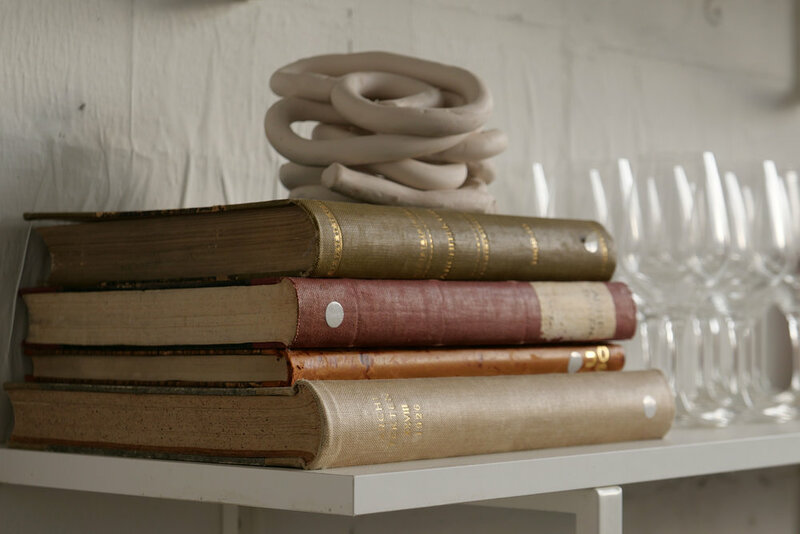 The study area for this project was the settlement of Lystrup. Historical maps, contemporary maps and flood maps were compared to correlate historical wetlands with flood-prone residential areas to resolve the actual relationship. Decisions about climate resilience have to include "the planning processes and decision-making mechanisms that shape urban development." We claim or reclaim land for new developments to extend urban areas and settle in places that in the past were considered to be either unsuitable or difficult for habitation and studies like this will make it possible to distinguish between the Dry and Wet City because "When the cloudburst occurs, the water takes over, and the ice age landscape emerges. The Wet City awakens." 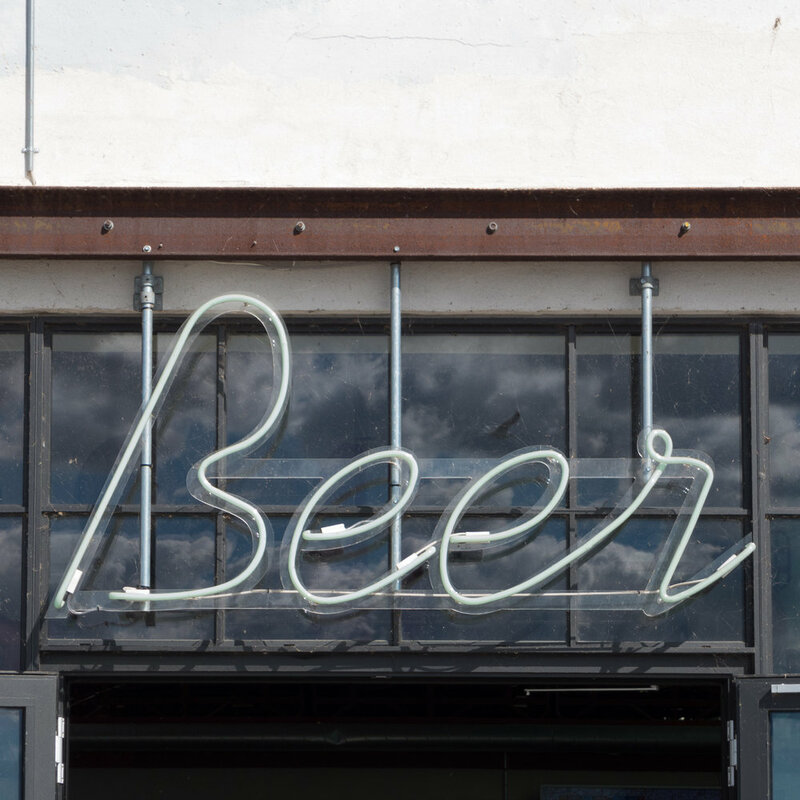 … explores concrete wood and steel but uses them in a way that challenges our perception of these traditional materials that normally we barely notice. 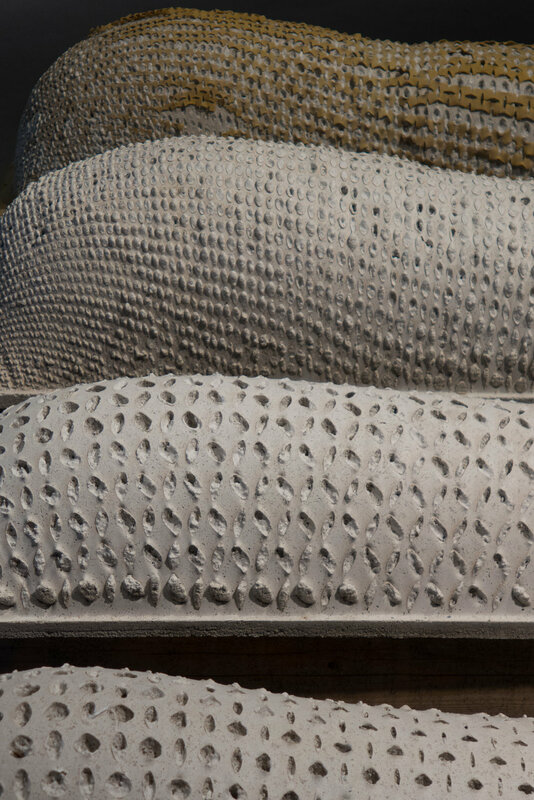 Concrete is twisted over curved and almost free form steel reinforcing rods to create shapes that are closer to sculpture than structure and in Intermediate fragments from 2014 ash is cut and curved and twisted using digital machining and then slotted into a complicated concrete base for a striking interplay of materials and forms. 10,000 pieces of Douglas fir were linked together with steel wire, the wood charred to form an unfamiliar surface that protects the surface from moisture using a technique related to the Japanese Shou Sugi Ban. When it rains the wood gives off a slight scent of smoke that enhances the experience and with use the colour changes to brown so you can trace where people have walked. For the festival in Aarhus in 2018 the Urban Carpet was installed on a traffic Island in the middle of the main road in front of the central railway station - an area of 100 square metres. 50,000 people cross over here every day but normally people do not notice the island so it is described as an overlooked urban space. The carpet challenges preconceptions and invites people to experience a familiar route in a new way. This project looks at the impact as people migrate from the country to the town and buildings are abandoned. It recorded but also intervened in the decay cutting through some buildings that are destined for demolition to reveal new views and a new focus on both the structure and on perceptions about how it was used and its role in the community as it is lost from a common history. Biopsies of the abandoned 2015 looked at a farmhouse in Ydby dated 1780 and tracked the decay of a pig shed. The reverse biopsy 2016 looked at an abandoned confectionary in Hurup two months before it was demolished. The building was cut through and for the first time that opened a view and link between the shop in the front and the bakery at the back and revealed a stratification and private history to stimulates a reassessment of the place these buildings had in the lives of people … those who lived in them and those who visited them or possibly knew them only from the outside. 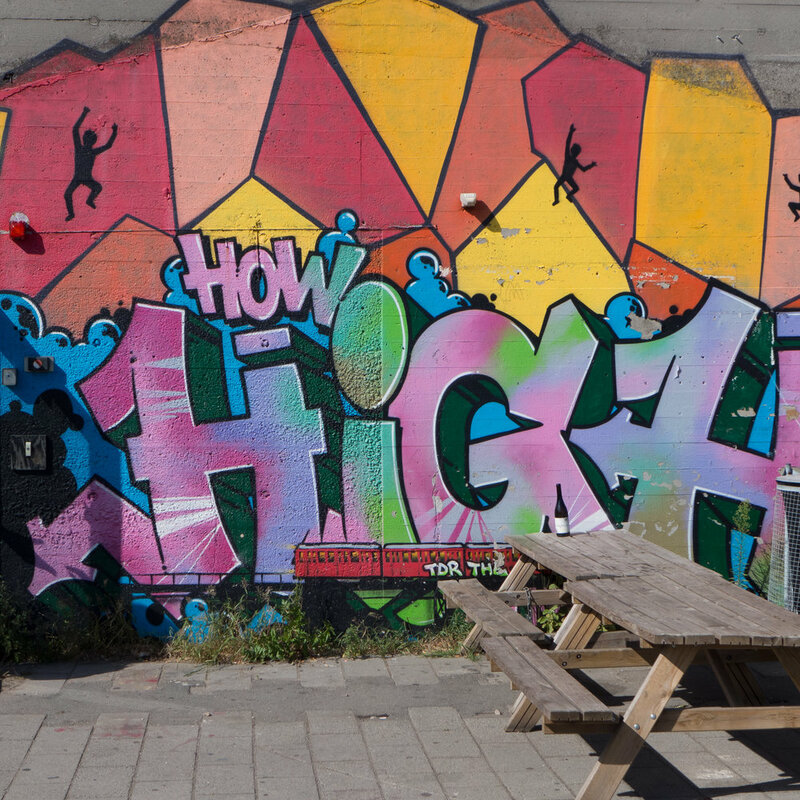 At the end of June a local plan - number 562 - was published by the city for Den Hvide Kødby / the White Meat City district of Copenhagen. This is the west part of a large area of market buildings and slaughter houses that developed here from 1879 onwards when the meat market was moved from a site further north, closer to the lakes. 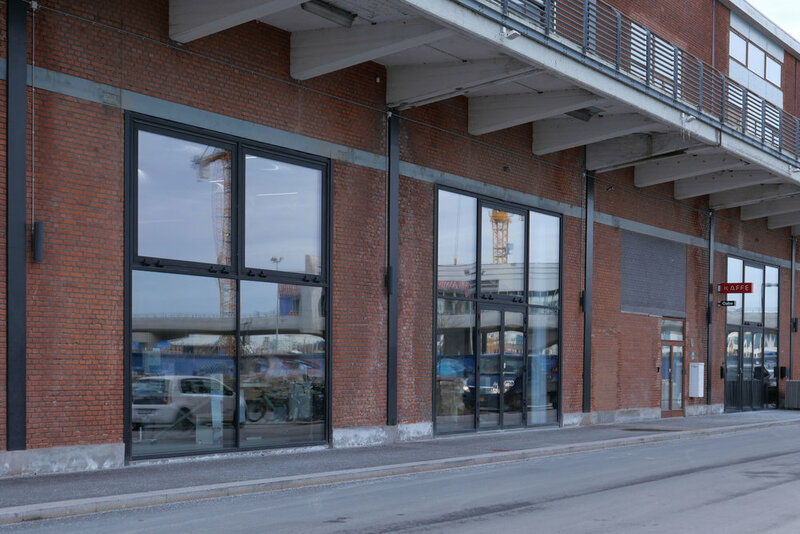 The market, sometimes referred to now as the Meat District, is west of the present central railway station and immediately south of a long open public space called Halmtorvet that continues on west into Sønder Boulevard and forms the north boundary of the site. Den Brune Kødby, the Brown Meat market, was the first part of the market to be built and is in brick. The buildings to its west - sometimes referred to as Den Grå Kødby or the Grey Market and included in this plan - were extensive additions to the market from around 1900 in grey or white brick and Den Hvide Kødby or White Meat City - primarily low and mainly flat-roofed buildings in concrete with white facades was a large addition to the meat market dating from the 1930s. In part because these are essentially industrial buildings but also because of the clean simple outlines with no decoration, then, in terms of style, this part of the market built in the 1930s is generally described as an important example of Functionalist architecture. Note that the popular reference to the east part as the Brown Meat market only emerged after the construction of the additions of the 1930s - to distinguish the different parts the names refer to the colour of the buildings and not to the colour of the meat. The area is owned by the city and this is certainly important for the long-term conservation of this area and for appropriate controls on detrimental development . 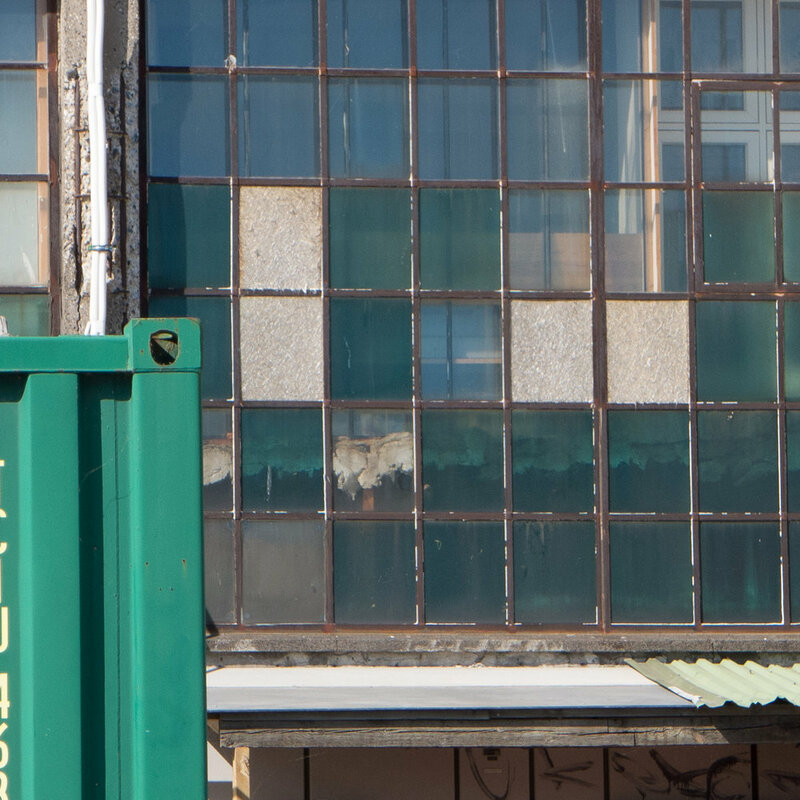 "The special quality of this area is defined by its industrial history: it is raw and green and brimming with initiatives issuing from progressive creative forces." 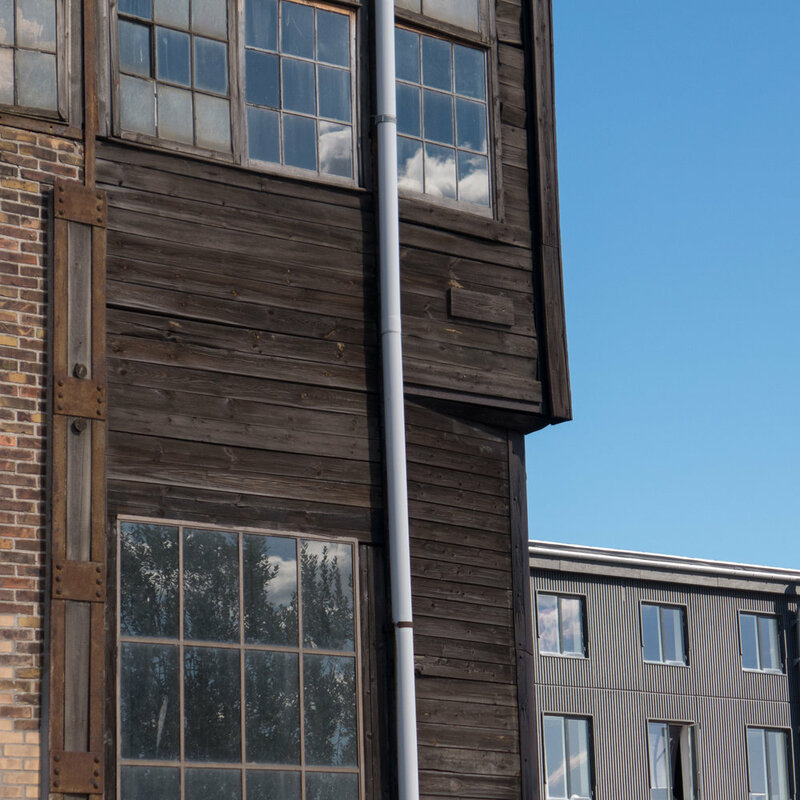 Copenhagen Contemporary is an independent institution for modern art. 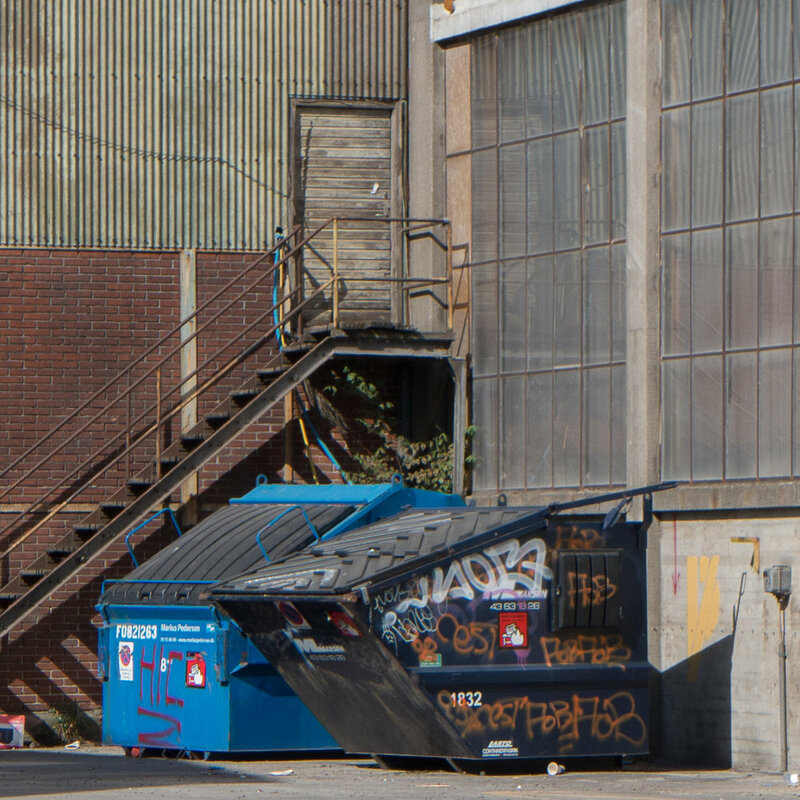 From June 2016 they ran a pilot project in the warehouses on Papirøen - Paper Island - in the centre of the harbour just south of the opera house - where CC took over four of the halls and were there until the end of 2017 when the buildings were returned to the developers for demolition and for work to start on new apartment buildings on the site. 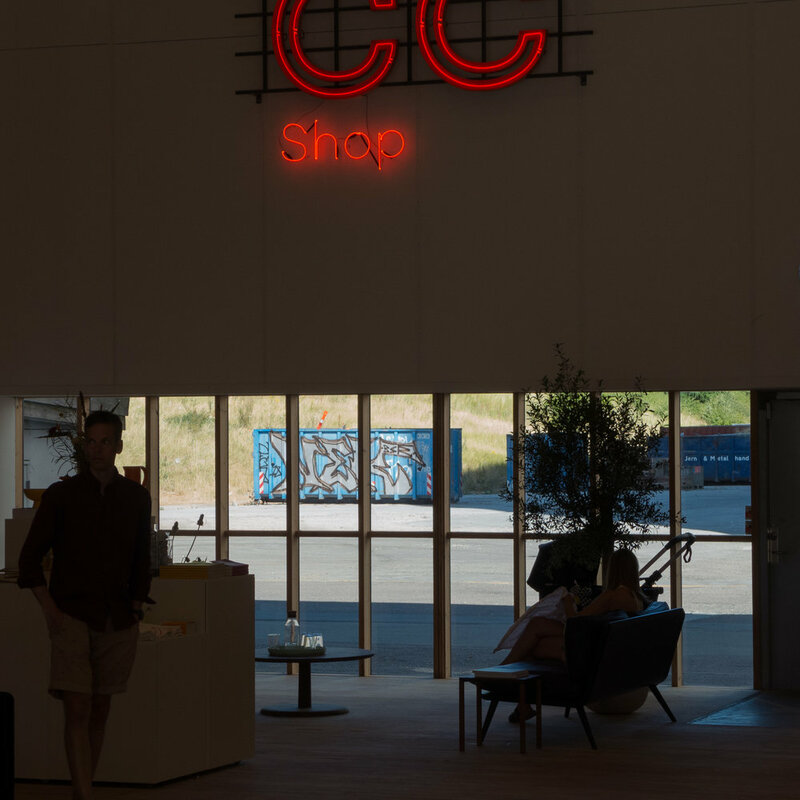 Now, with funding from the city and from private organisations, Copenhagen Contemporary have reopened in a larger space - some 7,000 m2 - in what was the welding hall of the shipyard of Burmeister & Wain. The ship yards were closed back in the 1990s and for the last two decades the area has been taken over by small workshops and boat repair yards. 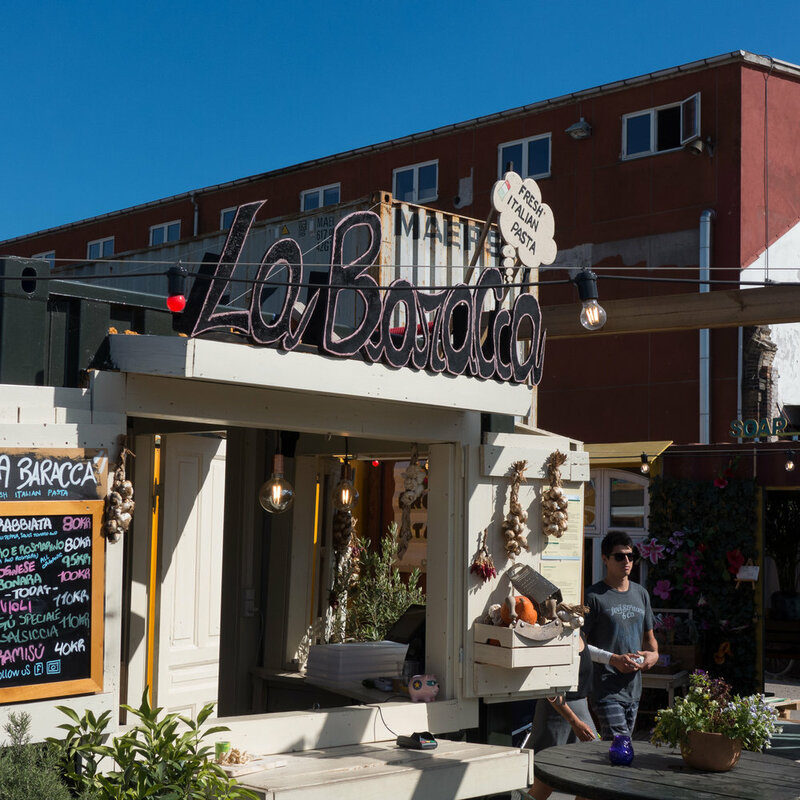 A yacht repair company, the restaurant Amass and La Banchina - a popular cafe and bar - established new businesses out here and this summer they have been joined by the new food market - many of the stalls also relocating from Papirøen - and there will be more artists' studios and craft workshops opening as more of the buildings are adapted. 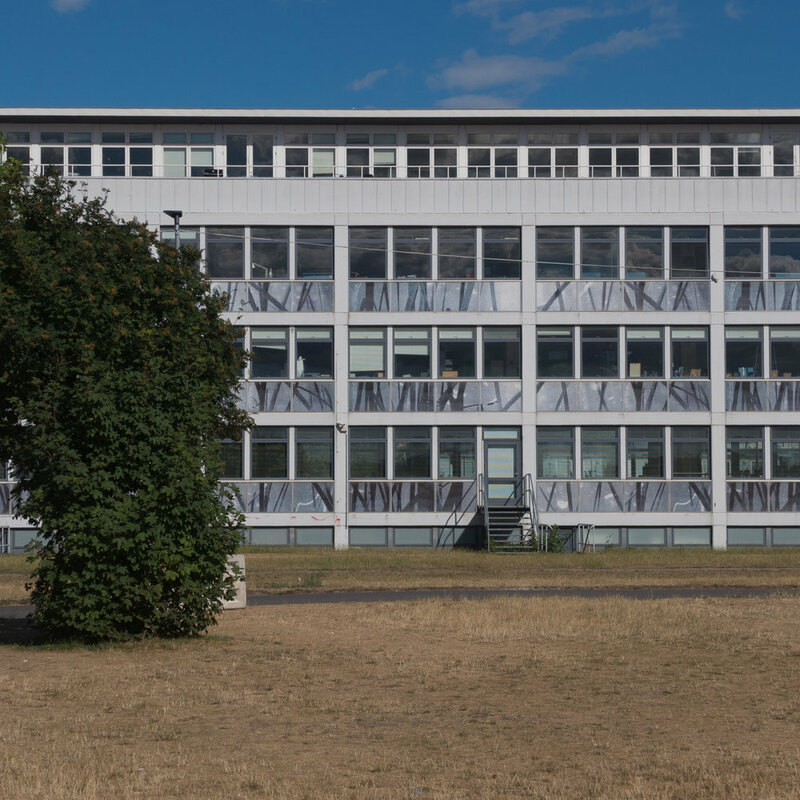 Copenhagen Contemporary has a lease here for 10 years and they have ambitious plans to establish a new space for the display of modern art in the city and particularly for large-scale installation and performance art. The city is gaining a major new venue on the lines of the galleries in Gateshead and the Turbine Hall at the Tate in London or the galleries at MoMA in New York and the programme here should compliment exhibitions of modern art at the established galleries in Copenhagen with Den Frie, GLStrand, the space of the Kunsthal in the former church of Sankt Nicolaj and the galleries of the Royal Academy at Charlottenborg - all in the centre of the city or close to the centre - and the gallery down the coast at Arken and, of course, Louisiana - north of the city with its amazing location on the shore of the Sound. 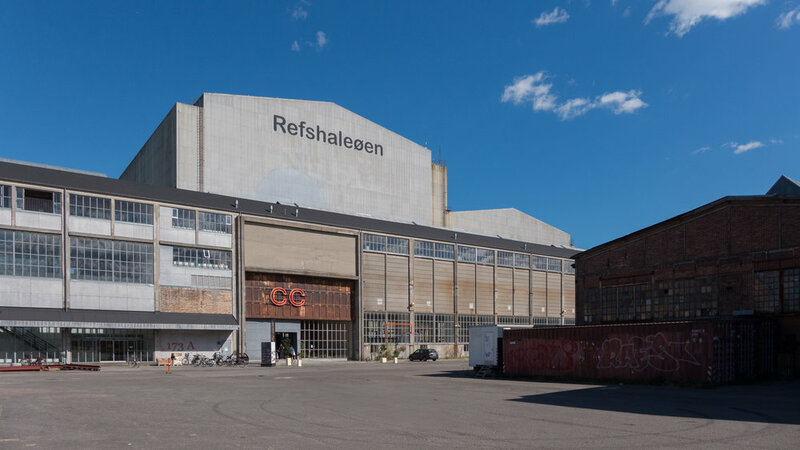 Work on the building for the gallery on Refshaleøen has kept many of the features from its industrial use with huge sliding doors, high exposed roof structures and high-set windows that flood the space with light and give views out to nearby workshops. In the next phase of development, space on the upper level will be opened for CC Studio for their proposed education programme. 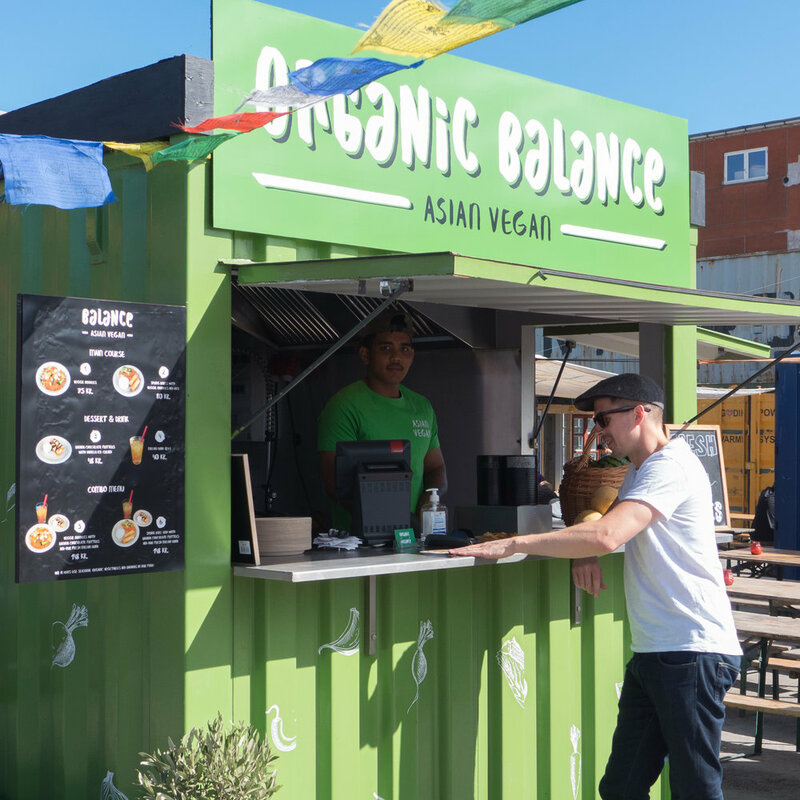 Popular food stalls that were in the warehouse on Papirøen - Paper Island - are back but on a new site further north - out on Refshaleøen - the island that until the 1990s was the yards of the ship builder Burmeister & Wain. 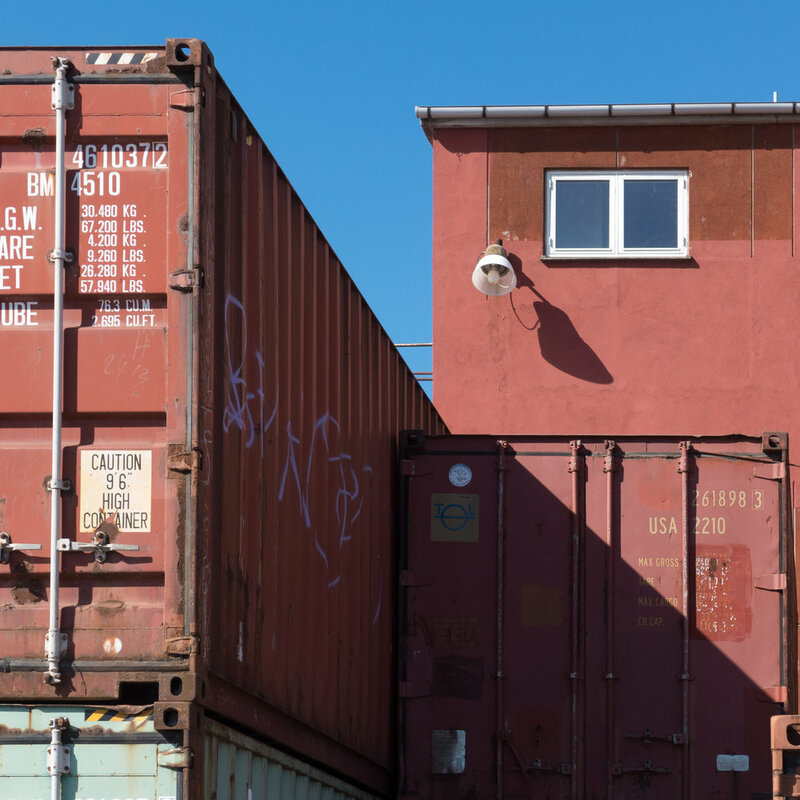 Called Reffen, the first phase is an open area with the kitchens and food stalls in shipping containers grouped around a new square and running down a short street towards the water of the harbour. The next phase will be more food stalls but inside in a hall in a former workshop. 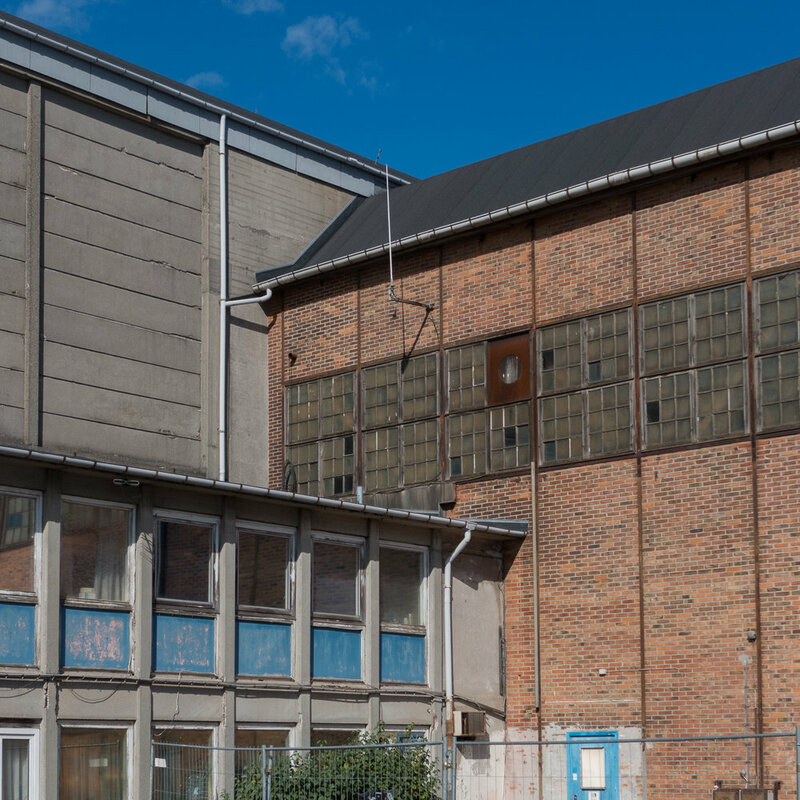 There is open space that will be used for events and the newly reopened gallery of Copenhagen Contemporary is in massive former workshops just to the east. Get here by taking the harbour ferry or a 9A bus that runs out here frequently from the central train station - this is the last stop where it turns round and heads back so you can't get lost - or you could always come out to Refshaleøen by bike. 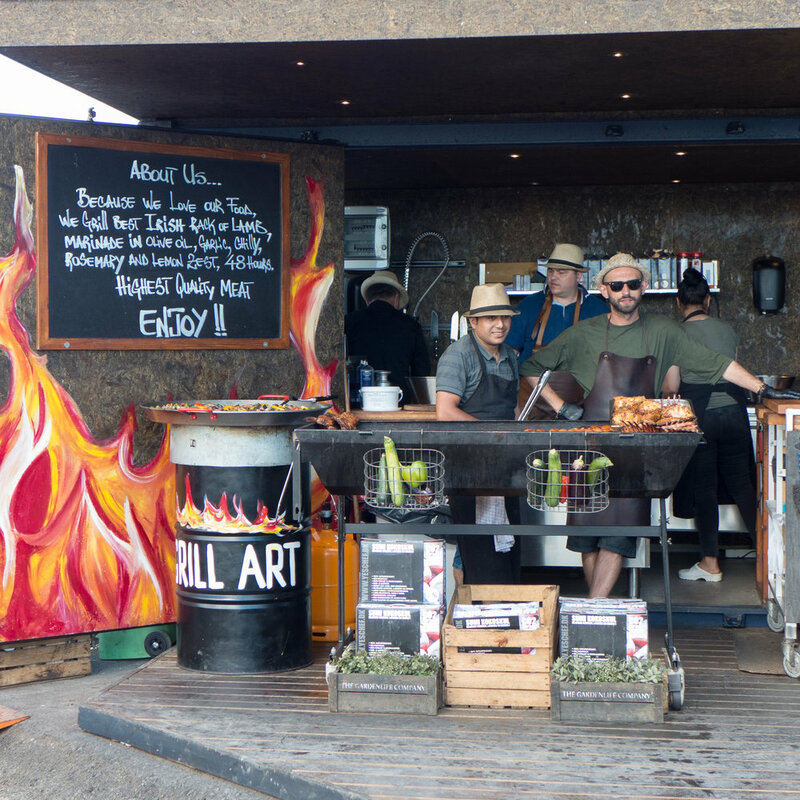 There is a short description of each of the food stalls online on the Reffen site along with information about opening times and details about events. Since 1620, there has been a bridge at the centre of Copenhagen harbour. 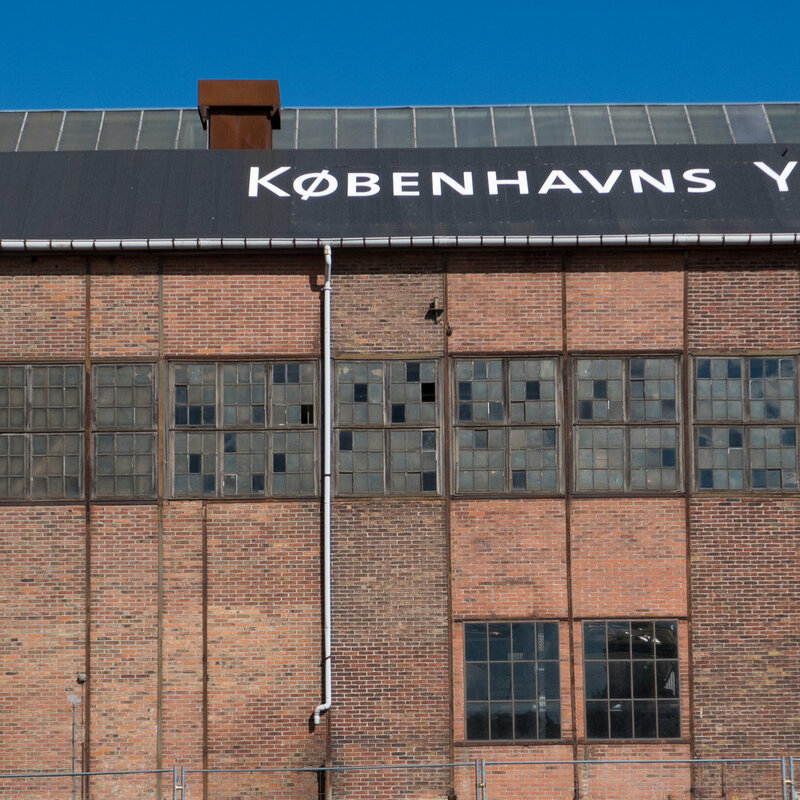 Knippelsbro was constructed to link the old city to what was, in the 17th century, a new and prosperous settlement of Christianshavn that was being built on land claimed from the sea and - from a new south gate of the city - there was a way across and on to the island of Amager. Over the centuries the bridge was rebuilt several times but these all crossed the harbour at the level of the quay so there was restricted headroom for boat traffic to pass through unless the bridge was opened. This became a problem in the early 20th century as the wharves and quays south of the bridge dealt with more and more goods so more and larger commercial shipping was coming through the harbour and as the number of people use the bridge to cross backwards and forwards increased with the building of large new apartments blocks along Islands Brygge and south of Christianshavn with new housing in Amagerbro and then in Sundby. A new bridge - the present Knippelsbro - was constructed and opened in 1937 designed by Kaj Gottlob. This has a much higher deck level - with long ramps up on either side to take road traffic up and over the harbour and more shipping could pass through without opening the bridge - the current harbour ferries pass under the bridge without it having to open. There were two copper-clad towers - with that to the north for the main control room for opening and closing the centre span and a south tower contained sleeping accommodation for the bridge master and his men. From the 1940s and through the 1950s and 1960s, the docks to the south of the bridge prospered with commercial quays extending down on both sides - so the bridge must have been manned throughout the day and the night - but with the decline and then the shutting of commercial wharves on the inner harbour, the number of times the bridge was opened each day declined and the south tower became redundant and was left empty and unused. Lars Erik Lyndgaard Schmidt and Malthe Merrild saw the waste of abandoning such a prominent historic monument and came up with possible ways of using the building. Last year, after several years of them putting considerable pressure on the city and after opening for a trial period to see if there was sufficient public interest … there was … and after extensive restoration work, the tower was opened to the public. It is now an amazing viewing platform from where you can see up and down the harbour but more than that it's a very unusual venue for events; a very unusual place that can be hired for business meetings during the day and, despite the tight space, it's a venue for gastronomic events and concerts. Today marks the first anniversary for Kultur Tårnet. Congratulations. Papirøen or Paper Island is at the centre of the harbour in Copenhagen, opposite the National Theatre, immediately south of the Opera House and north of Christianshavn. The settlement of Christianshavn, with its houses and warehouses and canals, dates from the early part of the seventeenth century when land was first claimed from the sea between the old city and the low-lying island of Amager. Then, for nearly a century, the area of water to the north of Christianshavn provided sheltered moorings for naval ships but a map of 1710 shows a new arc of distinct and recently-constructed defences curving out and round towards the Kastellet - towards what is now Refshaleøen. In stages, over the following centuries, new islands were created within the defences, divided by canals or open areas of moorings, with extensive boat yards and stores that were primarily for the navy but then, through the late 19th and the 20th century, increasingly for commercial trade. The distinct rectangular island now known as Paper Island, but officially Christiansholm, and the island immediately to its south, Arsenalholm are shown on a map of 1749 much as now but then linked by a central bridge rather than the current bridge at the west end of the canal between the two islands. By the 1990s both the navy and commercial shipping were moving out of the central harbour and there is a fascinating account by Klaus Kastbjerg - about how he acquired the island - that was published in the catalogue for Our Urban Living Room … an exhibition at the Danish Architecture Centre last year about the work of the architectural firm COBE. COBE have drawn up the master plan for the redevelopment of this prominent site at the centre of the harbour and construction work will start at the end of the year. Although not everything in the scheme has been finalised, drawings have been published over the last year or so that show a mixed development around a large courtyard or public garden with taller blocks of apartments but on the ground level there will be large halls that replicate, to some extent, the spaces of the warehouses that have become such a popular venue for Copenhagen Street Food and for Experimentarium - before they moved to new buildings in Hellerup - and now the gallery space of Copenhagen Contemporary. The public walkway around the island on the quay will be retained but with stepping down and timber terraces for getting to the water to swim or to get to moorings. 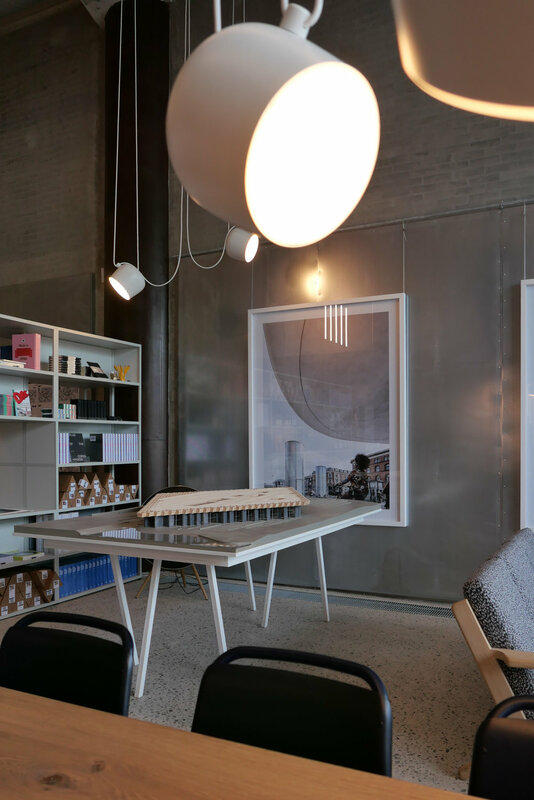 The style of the new buildings has been inspired by the materials and the pitched roofs of historic warehouses and workshops along the harbour. Three of the apartment buildings rise up to 12 or so storeys and even the lower buildings will be much more prominent than the relatively low warehouses here now but sloping back of the upper floors of the buildings - to give a tapered silhouette - will reduce their impact when seen from below and should, if the colours and textures of the facing materials are not to stark, add some focus and vertical interest to the skyline of the waterfront rather than dominating it. At the centre of the harbour is Knippelsbro - the bridge between the historic centre of the city and Christianshavn. 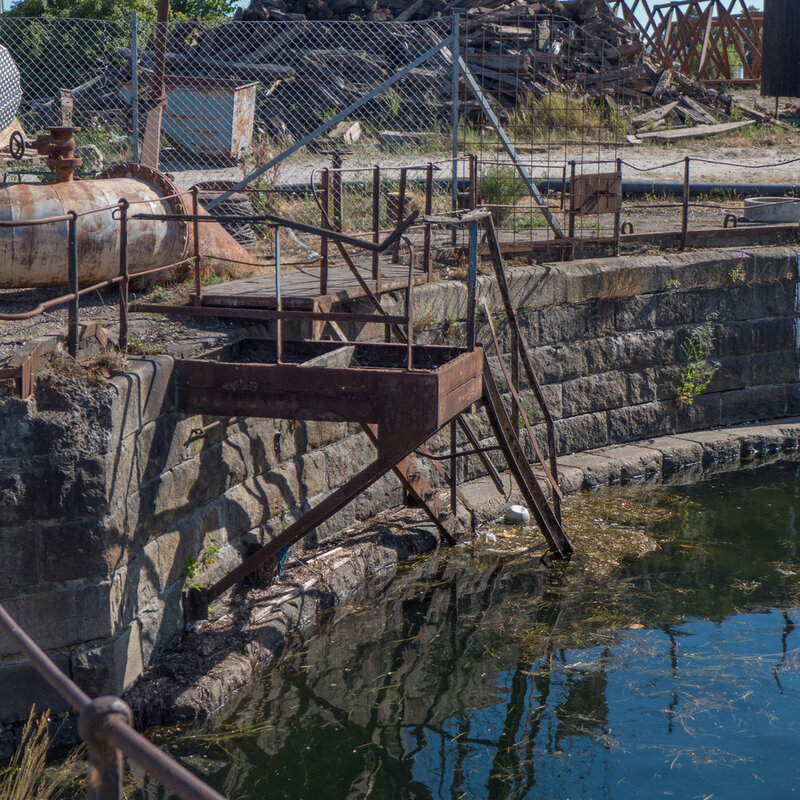 There has been a bridge here since the early 17th century when houses and warehouses were first built on land claimed from the sea in what was then a wide stretch of open water between the walled settlement of Copenhagen and the island of Amager. The present bridge was completed in 1937 - designed by Kaj Gottlob and built by Wright, Thomsen & Kier with Burmeister & Wain - an engineering company whose works were just to the west of the bridge and whose ship yards were then to the east at Refshaleøen. Earlier bridges had been at the level of the quay so had to be raised for most shipping to pass and were relatively narrow. As the port expanded, traffic crossing over and passing under the bridge increased so the new bridge, with a deck well over 27 metres wide, meant there could be tram tracks in each direction down the centre, wide lanes for traffic and wide pavements and, set much higher, with long approach ramps on both sides, the bridge only had to be raised for the larger ships passing through to the quays where the National Library now stands and to a long line of quays along the Islands Brygge side. With its two copper-clad towers on distinctive stone piers, set just out from the quays, the bridge is an iconic and perhaps the iconic feature of the inner harbour. Those towers held control rooms and sleeping accommodation for the men who supervised and opened the bridge but with the decline in harbour traffic the bridge is now controlled from the tower on the city side and the tower on the south or Christianshavn side of the bridge has been redundant for many years. A long campaign of lobbying and a serious programme of restoration work has lead to the south tower reopening as a new cultural attraction in the city. Visitors can climb up to the upper viewing gallery for amazing views up and down the harbour and in the process appreciate the quality of the well-thought through and careful design of the tower itself … now restored as one of the major monuments in the city from the 1930s that can be seen in its original form. 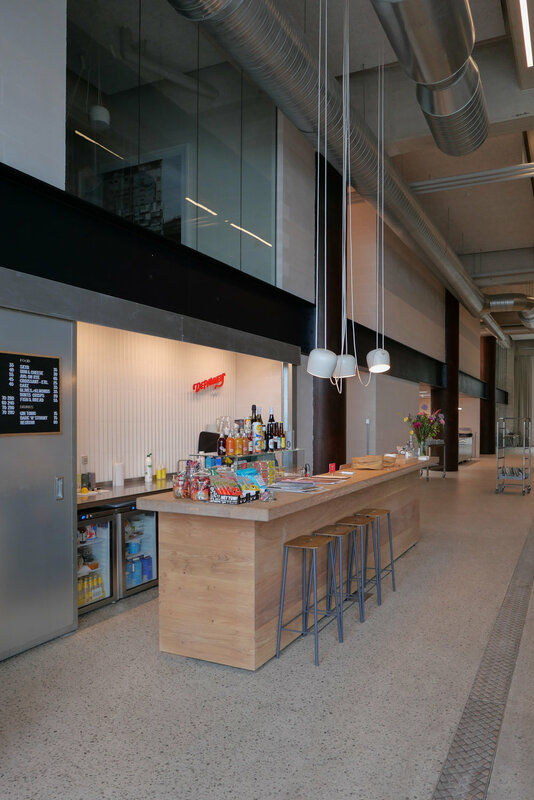 Some facilities were upgraded, including the fitting out of a new kitchen, so the tower can be used for social and cultural events including as a venue for meetings and meals and there have even been a couple of jazz concerts. For the reopening of the bridge tower, the team behind the restoration work have produced a combined guide and magazine. Narrower pages attached to the cover have a good selection of historic drawings, old photographs and information about the building of the bridge and its operation. Inside is like a good art magazine with a selection of newspaper cuttings about the bridge and some interesting photographs of odd objects found as work on the restoration progressed but there is also a review of the art installation Between the Towers by Randi Jørgensen and Katrine Malinivsky at Arken; what appears to be a declaration of love for the Eiffel Tower; an essay about the symbolism of towers through time and much more. With the opening of Belvederebroen at the south end of the harbour at the end of last year … along with Cirkelbroen or Circle Bridge designed by Olafur Eliasson that opened in August 2015 to cross the canal on the Amager side of the harbour and the Inderhavnsbroen that opened in July 2016 to link across the harbour between Nyhavn and Holmen … it is now possible to bike, run or walk around the harbour in Copenhagen. The complete circuit is 13 kilometres although shorter loops around smaller chunks using the older bridges at Knippelsbro or Langebro or by crossing over Bryggebroen - the bridge at Fisketorvet - there are shorter circuits of two or four or seven kilometres. 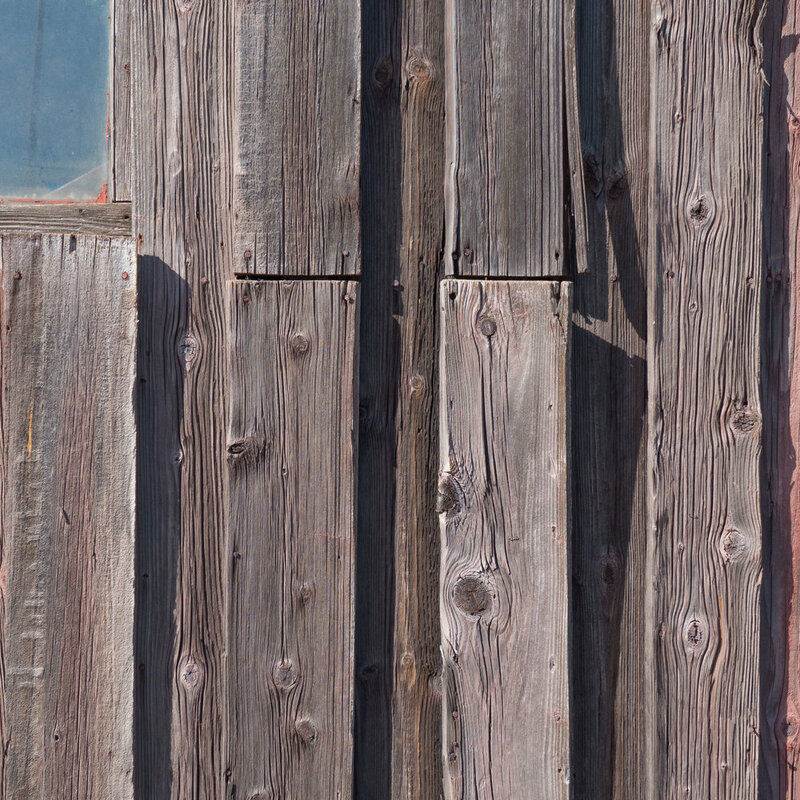 At intervals there are distinct signs in dark blue … appropriately close to the paint colour called Copenhagen Blue. Each post is at a key point on the route and they give, in Danish and in English, a short description of the immediate area and its history. If I was running the circuit I’d probably be using the sign for support as a tried to regain my breath … well beyond taking in the information but trying to pretend I was doing a few stretches before lurching off on the next section. My guess would be that most Danes running and certainly all Danes on bikes are going much too fast to read anything as they dash by. These signs also have a map that shows the route and the stops of the harbour ferry - the Havnebus - if you feel like seeing the harbour from the water. But what is interesting, and more important, is that the maps mark the dedicated cycle routes into and across the city. This tells you something significant about the planning policy in Copenhagen … there is a historic core where transport has to be co-ordinated and there is the well-known and well-established and coherent policy to encourage cycling rather than car use but, more than that, the cycle routes and the harbour circuit are about linking the city together, to make places accessible to everyone so this circuit is about much more than the regeneration of the docks. A map of the harbour can be downloaded if you want to plan your route but why not live dangerously and just go for it ... follow the signs ... you could end up back where you started ... or somewhere you hadn't planned to end up ... so much more interesting. 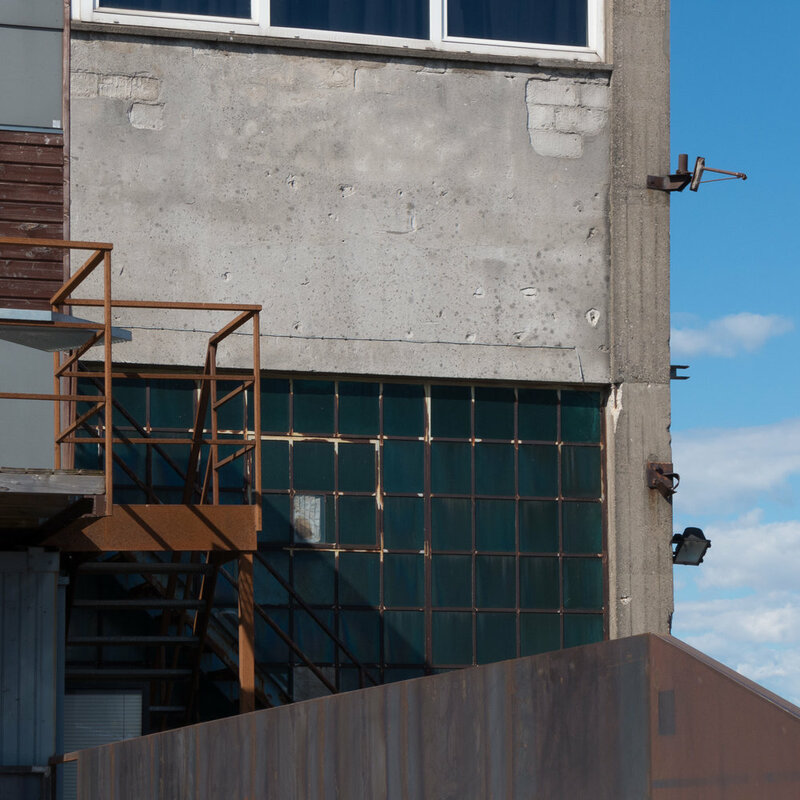 In any major city, industries change or the way that utility services are provided have to adapt or are modernised and substantial and striking buildings can become redundant. In Copenhagen many of these industrial buildings have been converted in an imaginative way to become housing or major gallery spaces for exhibitions or have become venues for concerts or theatre … buildings mentioned here recently include the former locomotive works that are now an exhibition hall - used for Finders Keepers and the installation by Hiroshi Sambuichi in The Cistern - an imaginative conversion of an underground water reservoir in Frederiksberg that is now a dramatic gallery space. Many of the buildings are not just striking or unusual but are normally exceptionally robust - they were built well and built to last - and some were designed by well-established or well-known architects and engineers so, from that point of view alone, they merit being retained but in reality that means justifying the cost by finding new uses. It seemed worth starting an occasional series of posts here about some of those buildings. The water tower at Jægersborg is on a high point above the city - about 12 kilometres to the north of the city centre and close to the rail line and Jægersborg suburban station. Designed by Edvard Thomsen and completed in 1954, it has a large circular water tank supported on a complicated and tight arrangement of concrete columns with 12 outer columns and 6 inner columns forming an inner hexagonal pattern of cross beams. The initial scheme included a plan for apartments but it seems the idea was abandoned because of noise pollution. An extensive remodelling of the tower by Dorte Mandrup Arkitekter was completed in 2006 to provide leisure facilities on the three lower levels and student housing above. Accommodation is in pods with bed-sitting rooms with large, full-height windows angled to make the most of the views and the sunlight.